The Obama administration recently said that it will begin to crack down on companies that aren’t doing enough to reduce the amount of foreclosures that are taking place. This effort is trying to make the mortgage assistance program more effective. Officials will monitor the largest of the 71 participating mortgage companies via daily progress reports. If they don’t comply, the treasury warns that they won’t make payments to mortgage companies. The Treasury will publish a list in December of the mortgage companies, also known as servicers, that are behind in meeting their obligations. With the $75 billion Home Affordable Modification Program, the companies that agree to lower mortgage payments will be rewarded but not until the modifications are made permanent. Executives at the lending companies argue that many homeowners who are given the paperwork to reduce their loans to as low as two percent over five years don’t get the paperwork back. Loan modifications aren’t prevalent enough and the economy is still hurting. The economy has shown some signs of recovery over the past month. Despite this US employers continued to cut jobs in September of 2009. The unemployment rate for September is now 9.8 percent. 263,000 jobs were cut according to the department of labor statistics. The only sector to add workers was the healthcare sector which added 19,000 new workers to payroll in September. The manufacturing sector and construction sector dropped by over 50,000 jobs each. Since the recession began in December of 2007 the unemployment rate has doubled and so has job losses. Loans are down too from banks according to the Federal Reserve. Total loans at commercial banks have fallen at a rate of 19 percent over the past three months and loans to businesses dropped at a 28% annual pace. Banks need to fix their balance sheets and this is not an easy task because of the complications with defaults on consumer loans, mortgages and commercial real-estate loans. Actually, recently my credit limit was just lowered by half and my credit score is pristine(Chase and American Express). Banks are out of cash and aren’t loaning as much as they need to. A recovery in the economy isn’t looking too eminent and will take some time and this means that foreclosures will remain at a high rate of occurrence in the mid to near future. From July to August of this year 2009 foreclosures stayed decreased slightly. Florida, California, Arizona, Michigan, Idaho, Utah, Colorado, Georgia and Illinois comprise of the top 10 states for foreclosure filings. REO listings on the resale market are being more carefully regulated and dropped in August. Despite this, the number of foreclosures barely dropped and remains strong. Six states make of about sixty percent of the nations foreclosure rate. Some of them have improved in August but not by much. In August 2009, 27 states and the District of Columbia reported over-the-month unemployment rate increases, 16 states had decreases, and 7 states didn’t change. Nonfarm payroll employment went down in 42 states and the District of Columbia and went up in 8 states. Barack Obama’s stimulus plan has yet to make a major impact as homeowners continue to struggle to make their delinquent mortgage payments. His $787 billion dollar stimulus package might not be the fix that our economy needs. Hoover and Roosevelt didn’t fix the economy this way during the great depression. A call or lower taxes, less government, and ease of access to production could help boost the economy according to prominent economists. Either way, the economy doesn’t show any soon signs of recovering rapidly and foreclosures continue to remain high. Wells Fargo Increases Home Loan Modifications. Wells Fargo & Co. on Wed said they finished 33,172 trial and final modifications under the Home Affordable Modification Program through the end of Aug. That represents a 64 % raise in the past 30 days. The Gov’t program is geared towards helping people who can no longer afford to make their mortgage payments. Wells Fargo modifies one in every six home loans in the US. They plan on modifying more with the act and have modified many loans themselves for a total of about 285,000 loan modifications. This news comes as a Fed survey showed that most people believe that the worst recession since the 1930’s has stopped getting worse. It’s great to see Banks like Wells Fargo making an effort to help those in foreclosure and modify loans. Most experts aren’t predicting the job market and housing market to recover until mid 2010 despite signs of growth in the economy. Loan modifications are just one way in which banks and the government are trying to rescue the economy that seems to be paying off. Why is the Rate of Foreclosures so High in Some states like Florida, California, Nevada, and Arizona and not others? This has been a question on my mind and others for quite some time. Why exactly is the foreclosure rate so high for some states and not others? There are certain observations that we can make to help us reach some answers. First let’s look at infrastructure. Many towns in Florida simply weren’t built for getting high paying jobs, just the sunshine was marketed. Leaving room for jobs is important when planning a city and going on without it is a disaster waiting to happen. People in California will pay a ridiculous amount per square foot for a condo or house that isn’t really worth that much. The jobs that they get aren’t nearly paying enough for this extra cost and that combined with other un-factored costs of living leave people stranded and facing foreclosure. Let’s also not forget about Real Estate investors. Buyers were looking to invest in houses in these states. Then all of a sudden, the housing market bubble burst and home prices dropped dramatically, leaving them no chance for profit and facing foreclosure on the properties. People put too much money into these states based on artificially inflated prices and “fun in the sun” when there really was no good market to begin with. Bergenfield, NJ January August 20th, 2009 – NJLispendens, http://www.njlispendens.com is releasing pre-foreclosure listing information to the public for the month of June. NJLispendens offers detailed pre-foreclosure information updated daily, allowing real estate investors, lenders, and Realtors to locate recently filed foreclosure actions as they are recorded in the courts. NJLispendens is reporting an increase in pre-foreclosure listings from May 2009 to June 2009. The records show that in May 2009 there were 4,996 foreclosure actions started. In June, there were 5,450 foreclosure actions started. NJLispendens attributes the increase to more lenders continuing stalled foreclosure actions and a backlog of records in the courts because of the large volume of foreclosures. President Obama has assertively dealt out plans to stop new foreclosures and reduce pending foreclosures since his inauguration on January 20th, and we had seen some lenders respond by imposing moratoriums of varying lengths. The massive number of initial foreclosure actions filed has backlogged the recording process creating a jam in the release of lis pendens notices. Mortgage default filings have been increasing each month in proportion with unemployment figures. The Stabilization and Relief Act which was meant to slow down the pace of foreclosures has worked temporarily, but is not a long term solution to the high rate at which defaults are occurring. NJLisPendens is expecting an increase in mortgage defaults in New Jersey over the next few months as more borrowers default on their loans and as aged filings make their way through the court’s recording process. For additional information about pre-foreclosure records in NJLispendens, contact Joseph Fanning at jfanning@americanforeclosures.com or visit http://www.njlispendens.com. NJLispendens.com is a product of American Foreclosures, Inc. Created in 1999, http://www.NJLisPendens.com answers an increasing need for real estate professionals, real estate investors, and home buyers to locate current, dependable, and inexpensive leads with the ease of access that the internet provides. Unemployment in July dropped from 9.5 percent in June to 9.4 percent for the month of July. Does this mean that Obama’s stimulus packages and new legislation is working? The answer is not necessarily. What we do know is that the administration will spin it that way. A drop in unemployment of such a tiny percentage can mean that people simply stopped searching for a job. Remember that the unemployment rate encompasses people who are searching for a job, not those who gave up. The good news is that it seems that our out of control recession isn’ so chaotic anymore. Asian markets are also seeing signs of recovery and it seems we’ve reach the trough in the wave. I still don’t think housing prices will climb at a rapid pace as we have yet to see how fast America will recover. Foreclosures continue to occur at high rates and will so for a while to come. The Demand for U.S. home loans rose last week as a cry off in 30-year fixed mortgage rates to a three-week low boosted applications for refinancing, the Mortgage Bankers Association said on Wednesday. The average mortgage rate fell to 5.17 percent in the last week of July. This is boosting homeowner sales and refinancing. Mortgage rates were as low as 4.61 in March and the REFI gauge is still below 6,000 where is was in March. The decrease in mortgages rates has caused it to go up recently. Despite purchase home requests being slightly up, most experts are still predicting that a speedy recovery to the worst housing market since the great depression is not at all likely. There is still hope though as new and used home sales have risen due to lower housing prices, good mortgage finance rates, and the first time home buyer tax rebate. The unemployment rate is still on the rise at almost 10 percent (and over in certain states). 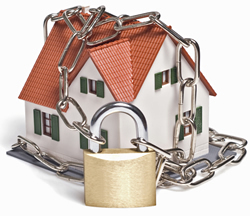 This is keeping many potential home buyers playing it safe and not buying homes. We will have to see what lies ahead and what new laws and regulations will take place to see when our devastated economy will recover. How Long Does it Take to Get a Good Credit Score After Foreclosing on a Home? Many people especially these days with the down market are wondering in the back of their minds just how bad does foreclosing affect your credit score? I’m sure that everyone has heard different percentages about how bad and how long your credit score is affected by foreclosing on a home. To put these rumors to rest, I thought I’d tackle this topic. To start a creditor can’t lend to you for 2 years after a foreclosure. This means a loan on anything including, home loan, car loan, student loan, buying a computer and more. Also, people who check your score like, land lords, cell phone providers, and credit card lenders won’t approve you. Your score can drop as much as 300 points. Going into foreclosure does not permanently destroy your credit score and loan receiving abilities. After 24 months your credit score will begin to recover assuming that you pay your debt off on time. It will still take 7 years for a foreclosure to be completely offer your credit record. However, after 5 you may be able to get a home loan, but at a high interest rate. You can always refinance after 7 years (total from your foreclosure) and get a lower interest rate once your foreclosure is off of your credit record and you can prove that you have a stable income. Foreclosing isn’t the end of the world but will certainly put your credit out of commission for a few years. If you do find yourself in trouble, it’s best to consult a finance expert and weigh your options.